Once upon a 1988, the Strollers toured to Antwerp, and, having trialled ‘adopt a colt’ with Pete Carter the previous year, were reinforced by a veritable bevy of colts (and they did – veritably bevy!!) in the shape of Mike Bailey, Julian Williams, Dave Woolley and Sean Wilkinson – all ‘fresh from their triumph against Waterloo in the Lancashire Colts’ Cup. We were down to play Rubes and Boitsfort, so we needed them! If memory serves we won both – and if it doesn’t serve, it’s ignored. The lads also manfully continually replenished our (and their!) glasses from a large yellow plastic watering more of which anon. Unusually, the boat back was from Rotterdam on the Monday, and we had our usual riotous end-or-tour journey and even got some sleep. 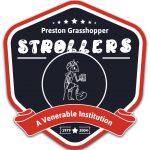 We were somewhat taken aback, however, when early the next morning the ship’s tannoy announced that ‘Preston Grasshoppers Strollers appear to have mislaid their watering can, and they can get it back in exchange for the items of clothing which do not belong to them’. At this point there were four very red faces – particularly that of Mike Bailey which was crimson. It transpired that the lads had found a ‘crew only’ door unlocked, and Mike had led them on a tour of the crew’s quarters, which culminated in the Captain’s cabin, and in finding his #1 Dress Uniform in a suit carrier. Well, what were red-blooded Grasshopper Colts to do at this point? Of course! They nicked it – and all was well until the aforementioned announcement. A shamefaced exchange was arranged, the uniform was returned unharmed, and the watering can appeared none the worse. And so another amusing tour happening ended . . . . . .